Acadalus Self-Leveling Tripod Head | OhGizmo! 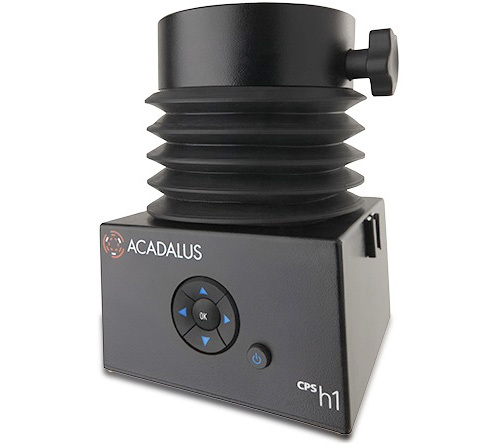 If the thought of never having to manually level your tripod’s head appeals to you, and I mean really appeals to you, to the point of happily dropping $5,000+ to let a device do it for you, then let me introduce you to the Acadalus self-leveler. Created by Dr. Carl Koch, the CPS-H1 uses a digital inclinometer and stepping motors to automatically level your camera in just a few seconds, while a set of 4-way directional buttons allow you to further adjust or tilt the camera along the axis of the lens as needed. I’m not exactly sure what the Acadalus’ weight limits are when it comes to the type and size of camera it can automatically level, but I do know that if you don’t think you’ll have access to AC while on set you’ll have to also pick up the optional 2800 mAH 18.5 V lithium ion rechargeable battery pack which is good for about 2 hours of continuous use, and an extra $500 added to your credit card bill. carl koch is really one of the greatest mind in photography, and once again he has came with this instrument. I wrote a report on Carl Koch. he is a modern day genius.